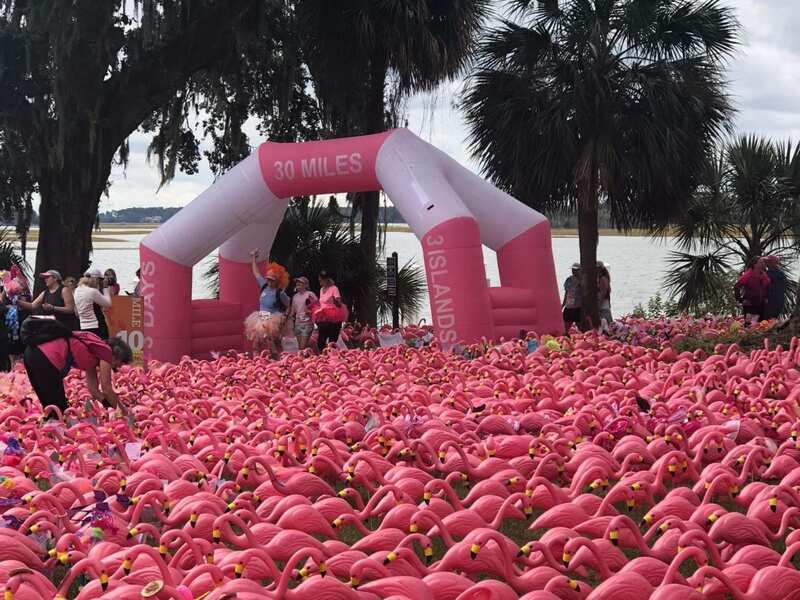 Bragg Media provided short-term creative support and publicity for Pledge The Pink, a three-day, three-island, 30-mile walk or run event to raise money for breast cancer treatment. Our team lifted some administrative burden for the non-profit organization’s founder, Laura Morgan, who creates and plans the annual event. We also provided publicity for the event specifically targeting the greater Bluffton area. Pledge The Pink is a non-profit organization that aims to raise awareness and money for breast cancer treatment and research with an annual event that attracts more than 1,500 women and men from all over the United States. The group’s founder, Laura Morgan, puts her heart and soul into the event every year — painstakingly managing every detail to ensure the participants have a truly great experience. In 2018, Pledge The Pink’s three-day event took place on Hilton Head Island SC, Bluffton SC and Fripp Island SC. The event has a base of PTP super fans who congregate on the event’s Facebook group, sharing their training progress, words of encouragement and oftentimes their stories of survival. The PTP audience consists largely of women who are fighting cancer, who have survived cancer or who have loved ones who are affected by cancer. The 2018 PTP event involved a first-ever location — Old Town Bluffton SC in the All Joy neighborhood extending beyond Myrtle Island. Bragg Media provided publicity in the weeks leading up to the event to attract nearby homeowners and business owners to get involved by volunteering or cheering on the participants as they walked/ran by. Bragg Media issued several press releases to the local news media — including newspapers, magazines, TV and radio. We secured some pre-event and post-event print coverage, as well as an interview on WSAV-TV. In Old Town Bluffton SC, however, there is nothing like an old-fashioned handshake. PTP’s mascot is a pink flamingo named Fancy. We created several renditions of Fancy in various settings. We also designed digital graphics, posters, fliers and rack cards that kept with the PTP brand message and identity. One of the most important services we provided was on-the-day Facebook coverage of the PTP event in Old Town Bluffton. Throughout the day, we took the coverage live — cheering on participants, asking them where they were from and what brought them to PTP. The man-on-the-street interviews with random participants proved to be the most popular among PTP’s audience. An interview with a Chicago firefighter dressed in his uniform and pushing his elderly mother in her wheelchair was shared nearly 30 times, liked more than 300 times and viewed more than 3,000 times.